So the trademark of Elder Newbold and I’s 3 month companionship was tracting. I honestly feel like we knocked half the doors in Lake City. Though most people were not home, so we never actually talked to half the people in Lake City, but we are making up for it now. Our method, street contacting. Turns out that is far less intimidating to roll up on a bike and talk to somebody than to drive slowly and creepily through a neighborhood in our car having everybody immediately recieve wrong impressions of us. Being on bikes though has allowed us to implement the fail-proof finding method of talking to everybody. Although we are drenched in sweat and soaked by the rain we find we can quickly disarm people by flashing our pearly whites and giving them a friendly wave and a “hi sir\ma’m, how are you doing today”! To back up my testimonial, the following is one of our success stories. So, we were biking home late friday night and passed a guy walking on the sidewalk. At first I did not stop justifying the heinous crime by saying that we were done with teaching for the night and it was time to go home. The spirit quickly worked these blaphemous thoughts out of my mind and I found myself squeezing the brake and turning the bike around. We approached the guy in our usual friendly manner, and began to converse about gentile things such as Star Wars–he had a tattoo of something star wars–and his particular line of work. We quickly navigated to the fact that we wanted to share with him the message of the restored gospel. His name is Blaze and he is one of our newest investigators. We are going back for our second appointment tomorrow. As we kept biking home we passed a gentleman walked and eating a McDonalds hamburger. We informed him of who we were and ended up sharing with him the message of the restoration and being invited to come teach him at his house. All in all, street contacting is much more affective than tracting. Some more great news is that Stefan Sutton before he has even been baptized taught a lesson to some of his co-workers during the lunch break about faith and he even used the Book of Mormon. 🙂 To all those who are NOT doing member missionary work… shame on you. We also had the blessed opportunity to give talks in sacrament meeting. I made a deal with Br. Cook who was speaking with us that if I only left him 3 minutes he would buy us lunch. I agreed and prepared a long talk. When it came time to make good on my side of the deal, I forgot all my notes at the apartment. Luckily, the topic I had been chosen to speak on was prophets, and well, we spend all day teaching people about that. So I was still able to keep my side of the deal. I tried my best to stick to the New Testament during my talk because our investigator who came to church, Nick Harwell, was a preacher for ten years and I wanted him to relate. It made me really happy to hear that he enjoyed it. It was a great week though! I just want to encourage ya’ll to speak to someone new each day this week. Just say hi, introduce yourself, give them a compliment, and it should flow very nicely from there, then when the setting is right invite them to hear the wonderful message of the Restored Gospel of Jesus Christ. If they say no, oh well, be there friend anyway! Gospel means good news, and this message is the greatest news that anyone could hear because of how happy I know it will make them. Many of you have experienced the joy of the Gospel, so why wouldn’t you want to share it with friends or strangers. Whether they realize it or not. It is the ultimate expression of love! 🙂 Go out and be missionaries and spread the Love of Jesus Christ!!! Which simply starts with flashing your pearly whites and saying hey! Luckily we didn’t go for me. We actually got a call that woke us up yesterday morning from the mission mom and she told us to go straight the ER to go give the two sis. missionaries in our ward a blessing. After getting ready (shirt, tie, tag, and a part in my hair) in 5 minutes, we noticed that it was 1:20 in the morning. It was a neat experience, though. The poor Sister has kidney stones. I sealed the anointing, and the blessing I pronounced was focused a lot more on her mission than on the sickness which was very interesting to me. By the time we got home, both Elder Newbold and I were wide awake and it took like 45 minutes for us to fall asleep. But despite the sleep deprivation it was a great sunday! This past week was pretty rough until Friday. We had great member support with a lot of member lessons, but our afternoons were very unproductive. We only had 5 other lessons until Saturday. 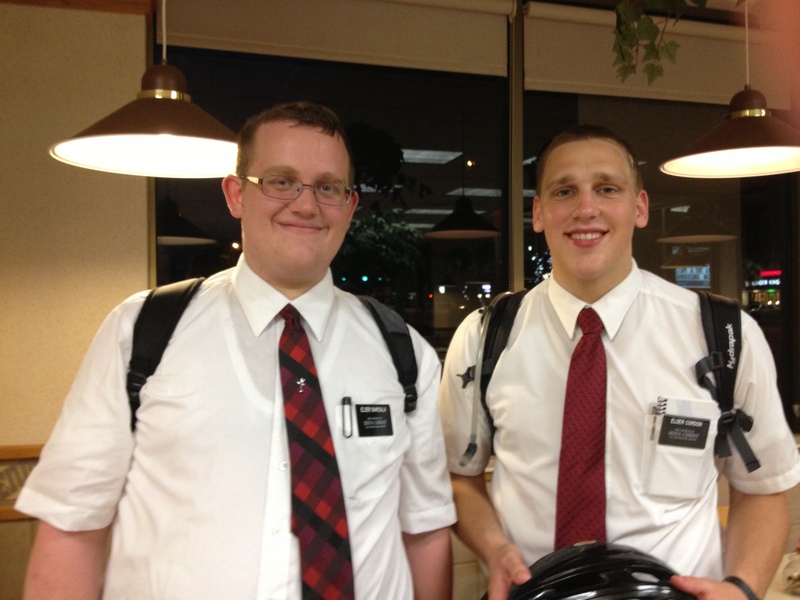 Luckily when i was on a trade-off with Elder Jensen in my district we worked really hard and got a terrific 7 other lessons. A lot of them being from tracting. They say tracting is the least effective way to do missionary work, but if it is all you have to work with the Lord will bless you. I think our area is a perfect example of that. We had two great lessons this weekend with two different pastors. One was a non-denominational one and the other was a Nazarene. I will say that the promise from the Lord that known will confound you is very true. Not to say that they tried to twist our words, but we always had a sound, doctrinal answer to reply with. One after a long engaging conversation said that he enjoyed it, but we were never going to convert him, but the non-denominational one became a new investigator and wants us to come back! Also, one of our investigators, William, is just such a character. I love the kid though. He is 18 and has moved over 7,000 miles, has been married, had a kid, divorced, and now he lives at his Sisters place. We have been meeting with him for a couple weeks now and just out of the blue he cut is long hair and looks a lot sharper. He also just has such an incredible understanding of the things we are teaching him. Before we even explained it, he knew what the baptismal covenant was, and what he had to quite doing before he was baptized; it makes it really easy. He agreed to try to quite smoking, but he has never tried before. I believe in him! Anyhow, I transitioned my study to help me build a stronger testimony of Christ, and the principle engine for that is James E. Talmage’s, Jesus The Christ. I read a chapter every morning and then record my thoughts. It is just incredible how much my image of the savior has matured in just a week. I have been brought to tears several times and I am only his baptism. I can say with complete certainty though that I know that Jesus IS the Christ. I have no doubt in my mind that he lived, and he that he suffered and died for each and everyone of us. He did it because he LOVES and our Heavenly Father asked him to do it because he LOVES us. Christ made it through the trial of this life, but none of us can do it alone. That is why he reaches his hand out to everyone of us and offers the gift of his atonement which will lift everyone of us to be better and do more. I experience the blessing of the enabling power of the Atonement each and everyday! I know that without Christ life would be hopeless, and I know that because of him we can have hope! I love you all, but God loves you more!